European Champions Cup: Can Ulster end Leinster's European rule? "They are arguably one of the best club sides there has ever been and it is a massive test for us." Ulster captain Rory Best is unequivocal about the challenge his team face as they go up against Leinster in their European Champions Cup quarter-final. The Dublin-based side are the reigning champions, the leading points (204) and try (27) scorers this season and have not lost at home in Europe since 2016. There is no question that Best and his team-mates will go to the Aviva Stadium as underdogs on Saturday but the absence of Leinster captain Johnny Sexton and the return of Iain Henderson to the Ulster second row will give the travelling supporters some hope that their side can upset the odds. The following are key battlegrounds that Ulster will need to turn to their advantage if they are to reach a European semi-final for the first time since 2012, when they went on to lose to Leinster in the final. Saturday's match at the Aviva Stadium in the heart of leafy Dublin 4 will mark the sixth anniversary of Ulster's last win in Leinster's home territory. Ten months after the heartbreak of their Champions Cup final defeat at Twickenham, Ulster battled to a 22-18 win at the RDS as the northern province sought to show that they belonged among the elite of European rugby by effectively securing their place in the Pro12 semi-finals. Two months later they returned to the same venue and lost a fiercely-contested final that marked the start of an eight-match losing streak that they have been unable to halt. The RDS has become an unhappy venue for Ulster teams but former fly-half Ian Humphreys believes the switch to the Aviva Stadium this week could benefit the visitors. Humphreys says: "You go to a ground like that and you feel a million dollars. Your chest goes out and you don't care who you are playing, whether you are home or away." "Ulster will feel like 'this is a venue in Ireland, this is a home venue for us' and they will be going there with a huge vocal support behind them." Leinster are the most potent club in Europe this season, averaging 4.7 tries per match, and scored six tries against a second-string Ulster side when the two provinces met earlier this season. The absence of Sexton robs the hosts of some playmaking ability but their backline is still well stocked with potential threats such as Jordan Larmour, Adam Byrne and Garry Ringrose and Ulster must find a way to blunt their opponents' attack. Dan McFarland's side were the most disciplined team in the pool stages, conceding just 38 penalties across their six games, and a similar performance on Saturday would go a long way towards securing a win. Under new defence coach Jared Payne, Ulster have conceded at a rate of 2.62 tries per game this season and have shown an ability to mix their defensive strategy to counteract specific opponents. Best warns that his side will need to maintain that discipline for the entire match, adding: "What Leinster are unbelievably good at is if you switch off for just one moment they can produce something. "That is the test and it's ultimately the test you look forward to - knowing that you have to be on your game right throughout it because just one slip against that sort of team and they will score." Ulster are not the only Irish province to have benefited from the success of the Leinster academy system over the past decade. The strength in depth of Leinster's playing pool has led to a number of players moving to rival provinces, with British and Irish Lions prop Jack McGrath the latest to be linked with a switch to the Kingspan Stadium for next season. Ulster's squad on Saturday will feature seven players that have previously worn Leinster colours including Ireland internationals John Cooney, Jordi Murphy and Marty Moore. 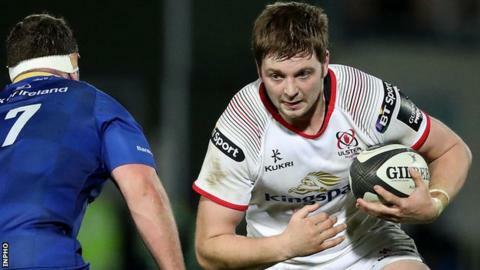 Flanker Murphy will be going up against his former team-mates for the first time since he raised the Champions Cup trophy alongside them last May and he will be one of several Ulster players with an added incentive to succeed on Saturday. Leinster head coach Leo Cullen joked: "I'm trying to remember back to what Jordi will remember, amongst a few others! "Jordi is such an integral part of what the team achieved here last year - demonstrated by being brought up to lift the trophy at the end - so I'm sure he'll be highly motivated playing first and foremost and then [we'll have to think] about what he remembers and how do we go about tweaking a few little things in our game based on what we think he might know."